Say Hello to a new product from The Body Shop, their first 100 % vegan Make-up Setting Spray ! 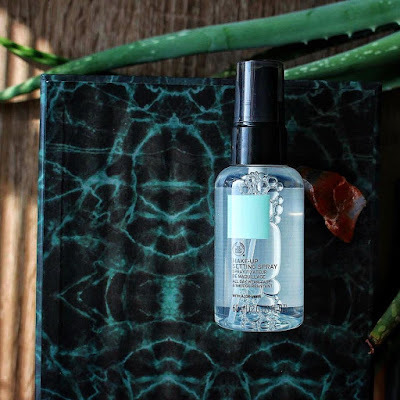 Fade and smudge resistant, this Makeup Setting Spray mist from The Body Shop is enriched with Community Trade Aloe Vera, one of the most amazing plants. Like I mentioned before this is a vegan beauty product and cruelty free, one of the many reasons why I support and promote The Body Shop ! This makeup setting spray is formulated without petrolatum and mineral oil and is suitable for all skin types, even for the most sensitive skin like mine. It’s also coming in this friendly and cute travel size of 60ml and that makes it really easy and possible to take it with you everywhere you go, even when you travel by plane. Regarding the size I hope that The Body Shop will also make a bigger version of this makeup setting spray, because I would really love to have more of this at home and in makeup kit. I know for sure a lot of makeup lovers would like the idea of a bigger version of this makeup setting mist. I tried it and loved it because it did not dry my skin and it made my makeup look more polished and natural. This formula is weightless, non sticky and odorless. Used over foundation and powder it gives a really lovely skin-like finish. I love the fact that is has no fragrance ! If melting makeup is a struggle for you during warm sunny days you definitely need to try this new makeup setting spray, might be the one ! I am really happy that the days of makeup fixing spray that made my skin red and dry are completely over for me. I honestly dont know how this might perform on people with oily skin, as mine is not very oily but this formula is really light and quite promising when it comes to keeping my makeup fresh for the entire day. In my opinion this is a lovely product and definitely a beauty hero! Because I am curious, I want to ask how do you set your makeup on a daily base. Do you use any facial mist or a makeup setting spray to keep your makeup in place and fresh for longer?